Wing Man Carbon Fiber Baby Seat | OhGizmo! 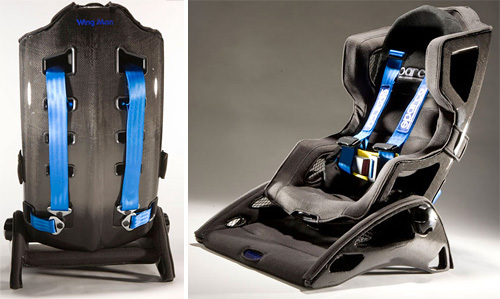 I’m sure there are plenty of gearheads who would jump at the chance to buy their kid this Wing Man child seat that features a body made from carbon fiber which everyone knows is extremely lightweight and strong. Unfortunately though the childseat is just a prototype created by Rory Craig, a student at the Art Center College of Design in Pasadena. And while you might think the seat is just another piece of eye candy, the Wing Man is actually quite functional. It can be reconfigured for all 3 stages a child goes through when it comes to needing a car seat, which means you don’t have to keep upgrading to a new model each time. And the race-inspired harness is adjustable thanks to a set of holes on the back, so it will properly fit and secure your child as they grow. All in all the Wing Man prototype cost Rory about $4,000 to create, and he’s trying to pitch the idea to Sparco Motor Sports who are already known for their line of seats, safety harnesses and other racing-related gear. Well, I guess this one just fits to both my car & my baby. Now he can sit beside me, naturally. I've been driving for work everyday maybe I can pick this kid with me.